Much as I love my smoothies, sometimes I could really do with a shot of pure juice. Not something from a bottle that is more sugar than fruit, but freshly squeezed juice full of vitamins, minerals and phytonutrients. To get us all in the mood, I’m highlighting 10 juicer recipes from juice loving food bloggers. Fruits, roots and leaves juiced down to their essential parts can be a real tonic. When I’m feeling under par, I dream of a healthy glass of juiced greens with ginger and a little citrus. I feel sure that would sort me out. But juicing can also be a great way of getting our prescribed ten-a-day, which can sometimes be quite hard. If you struggle with this, do visit my 10 a day pinterest board for lots of ideas. It’s important to note that fruit juice can be very high in sugar, so go carefully. It’s probably best to mostly juice vegetables, adding a little fruit for sweetness and flavour. At the moment, my juicing consists of squeezing citrus by hand using an old fashioned glass lemon squeezer – just add elbow grease. This works well in small quantities, but it’s not so great when making a batch of this blood orange squash for instance. I’ve often toyed with the idea of getting a juicer, but I’ve always been put off by the general mess and difficulty of cleaning that I’ve heard so much about. It seems that a new day has dawned and those fears can be cast aside: meet JUlaVIE. So easy, so powerful, so incredibly clean. 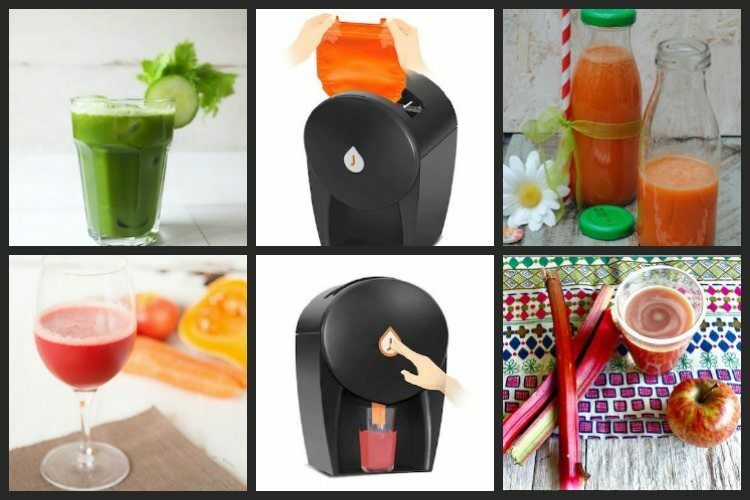 JUlaVIE is a revolutionary new juicer that takes all the faff and all the mess out of juicing. As one with intimate experience of turning simple juice extraction on the counter into a multi-coloured and spattered crime scene, this is a very good thing. All you need to do is place your chosen fruits, roots and leaves into a reusable bag. You place the bag into the JUlaVIE, press a button and in 90 seconds, hey presto, you have a glass of juice. Throw the little that remains into your compost bin and you have a clean machine that’s ready to be used all over again. If you don’t want to wash your bag, you can opt for single use bags instead. Using eight tons of force, the Julavie can squeeze juice out of almost anything. Sleek and mean, the JUlaVIE comes in a choice of three colours: black, white or red. Froothie will be stocking the Julavie very soon and I can’t wait to get my hands on one. Here are 10 juicer recipes from the food blogging community that I can’t wait to make. Don’t they sound delicious? The post contains affiliate links. Buying through a link will not cost you any more, but I will get a small commission. This helps keep Tin and Thyme blythe and blogging. Opinions are, as always, my own. Loads of great juicer recipes here! I can’t wait to try the JUlaVIE – no cleaning means I’d use it far more often. No cleaning means I’d consider having a juicer for the first time ever! My juicer doesn’t get used much mainly due to the size of it. I can’t wait to try the JULaVie! Yes, counter space is always at a premium and if I have to get a gadget out of the back of a cupboard, it’s unlikely to happen. I love juicing but hate cleaning my juicer after the fact. I can’t wait to try the JULaVie! It is the cleaning that has put me off getting a juicer, so the JUlaVIE sounds like a winner. Great collection of juice recipes here. Wow, no cleaning needed, I need this juicer right now:) Thank you for including my recipe here. Yes, I’m finding the concept quite exciting Camilla. Those smoothies look delicious and that looks like one amazing piece of kit! We’ve had a juicer for YEARS and it’s still in the box..unopened 😀 Hahaha! I love juice but, like you, fresh – not from a bottle. I’m also looking forward to getting my hands on a JUlaVie! It sounds amazing. I’m really looking forward to trying it out.